2. Tom Cruise arguing with Matt Lauer over the validity of psychiatry. 4. Banner for Hilton's site. 14. Lance Bass exits the closet. In early May, 2006, Tom Cruise grinned wildly at the reader from the cover of Entertainment Weekly. 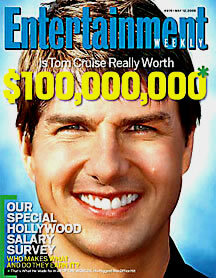 Only instead of promoting Mission Impossible 3, the magazine paired Cruise’s million-dollar smile with a questioning caption: "Is Tom Cruise Really Worth $100,000,000?" (image 1) For a star whose box office track record has established him as one of the few remaining sure-fires in an industry with increasing resemblance to a Las Vegas craps table, the gravity of such a headline is immense. Since Cruise is arguably the most iconic actor of the last twenty years, considerable damage must have been done to his star persona in order for a national magazine to question Cruise's drawing power as a cinematic colossus. But what truly brought Cruise’s actions into the limelight, what scrutinized them, parodied them, and facilitated their massive proliferation, is an institution even older than Hollywood: celebrity gossip. Us Weekly, People, Entertainment Tonight ran stories, of course. However, even more significant in its effect on deteriorating Cruise’s image, is the Internet gossip blog. With easy accessibility and immediacy, gossip blogs have set up shop inside the massive mechanism of the Hollywood star system. By combining snarky commentary with links to the actual video clips of and recollections about Cruise’s recent television appearances, gossip bloggers have been credited with causing Cruise’s star to begin its fall, his movie to perform below expectations, and Entertainment Weekly to question his worth on the marquee. Finally, as reported in an August 22nd article in Wall Street Journal, Paramount CEO Sumner Redstone publicly severed the studio's ties with Cruise, explaining, “His recent conduct has not been acceptable to Paramount” (cnnmoney.com). [open works cited in new window] As evidenced by Cruise's case, a blogger may significantly use posts to influence box office pulls and dent, inflate, and damage a star image. The most notorious of these bloggers is Perez Hilton (real name Mario Lavandeira) whose blog currently boasts more than a million hits a day. (image 4) Along with fellow gossip bloggers at The Defamer, Lainey Gossip, The Superficial, Jossip, and Pink Is the New Blog, Perez and his blog function as the newest component of the Hollywood star machine, integrating the established mechanism of gossip with the new, immediate accessibility of the Internet. Examining past and present posts, I situate Hilton and his blog within Richard Dyer’s landmark analysis stars, here focusing on the blogger’s novel role in star “production.” As Paul McDonald recently noted in The Star System, much of the work on stars in the last two decades has focused on stars as a “phenomenon of consumption,” rather than production, effectively “los[ing] sight of where stars come from” (2). In this paper, I aim to “partly redress the imbalance” that McDonald observes in past scholarship. While McDonald primarily concerns himself with star production by studios, this paper examines how the blogger occupies a unique position in the “industry,” functioning as both producer and consumer of the star image. This paper also focuses specifically on Hilton because his blog is the most read, most publicized and most thoroughly pervaded by the blogger’s own personality. 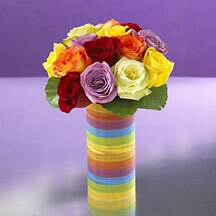 (image 5) As such, it exemplifies the union of traditional gossip columnists and new media technologies. But even more interestingly, Hilton, as a openly gay “queen” with an unabashed affection for all things camp, complicates these phenomena of star production and consumption. Whether by comparing an unflattering photo of a celebrity to a celebrated drag queen or launching incessant campaigns to "out" a star, Hilton's position in the queer community needs to be figured in any analysis of his influence. Most of this paper concerns itself with tracing the gossip blogger in relation to five key aspects of star production — economics, manipulation, fashion, magic/talent, and the nature of the medium – but also explores how each element of production is (or is not) influenced by Hilton's status as a gay man. I go on to assert that the gossip blogger’s use of new media is, in fact, a stripping of mechanisms mediated directly by Hollywood. As new media technology makes New Hollywood's mechanisms visible, gossip bloggers utilize this visibility to influence consumption. Bloggers illuminate the star system, and in so doing, alter our expectations and understanding of stars and their importance in society today. One of Dyer’s major assertions focuses on the fact that society, as opposed to any film's success or failure, truly makes or breaks a star. How we “feel” about stars – whether they seem likable, admirable, down-to-earth, worthy of devotion, glamorous, etc. – determines whether or not we attend their movies. With this in mind, as Internet gossip continues to proliferate, we need to evaluate how it may influence, much more than printed media, our perception and subsequent consumption of stars. Internet gossip sites differ from the gossip columns of Classic Hollywood. In particular, blogs represent a recent yet significant component of new media, a term loosely defined as the current cultural shift resulting from the ubiquity of and reliance on computers, digitalization, and the Internet. Blogs first garnered major media attention when they provided a means of rapid-fire discourse surrounding the 2004 Presidential campaign. They showed an ability to swiftly post material, engender debate, and garner a readership at once loyal and diverse. Here was a new way of stimulating discourse, a novel means of disseminating opinion, a 21st century method of reaching a technology-dependent audience. Less publicized that political blogs, the gossip blog serves a similar, if less dignified, function. Granted, its topics may include sexual preference speculation, cheap jabs at unphotogenic celebrities, and outright smear campaigns, but the import of the gossip blog is still considerable. “a complex configuration of visual, verbal, and aural signs....it is manifest not only in films but in all kinds of media texts” (35). Bloggers, concentrating not only the image itself, but also on the means of its production, have begun to alter the way that stars are “consumed” by the public. Granted, the public has long been knowledgeable of the strings of production – Joan Crawford's persona and name were chosen through a Photoplay contest; Rita Hayworth's cosmetic transformation was highly publicized, to name just a few – yet those strings were meant to be seen. Like any other part of a star's public image, they were constructed and willfully disseminated by the studio. Yet bloggers, even more than the gossip columnists who came before them, have broken through those walls of production, effectively exposing the “phenomena” of production. The remainder of this paper explores these methods of “exposure,” utilizing five of Dyer's categories of production as its loose structure. “....even in Hollywood’s heyday, stars did not absolutely guarantee the success of a film. Stars move in and out of favour, and even at the height of their popularity may make a film that nobody much goes to see....for this reason stars were a very problematic necessity from an economic point of view” (11). In other words, stars represent the ultimate in Hollywood paradoxes: a studio needs them, but they cannot “insure” actors' success with good roles or promising parts. The studio must rely on the actors' specific appeal in a specific societal moment. As society is historically as moody as a 13-year-old girl, this makes for mercurial rises and falls. For most of the 20th century, the task of recording (and influencing) a particular star's fortunes (and appraised economic value) fell to print media, specifically the form of the gossip column. Celebrity gossip is as old as Hollywood itself. For decades Louella Parsons, Hedda Hopper, and dozens of others served to arbitrate and disseminate all the star “news” that was fit to print. But with newspapers and magazines, the reader had to wait for a weekly update on the dynamic star lifestyle. With television, this delay was ameliorated with the introduction of celebrity “news,” especiallyon Entertainment Tonight and E!, a network devoted exclusively to celebrity culture and entertainment. The majority of E! 's programming schedule is filled with repeat broadcasts of “True Hollywood Story,” “50 Biggest Fashion Mistakes,” and similar productions. While these shows undoubtedly contribute to a star's image and subsequent economic value, once produced, the filmed shows remain static – unable to match their content to that of the ever-fluctuating star image. E! 's daily gossip show, Talk Soup, does provide dynamic, up-to-date accounts of star society. But the show provides more of a forum for other gossip guests, and is not a gossip-getter itself. “Talking gossip heads,” including Perez and other gossip bloggers, now regularly appear on Talk Soup to dish out gossip on specific stars or subjects. (images 6-7) In addition, since the show has a one-time broadcast, it requires the viewer to be present at a certain time, in a fixed location, to get the up-to-date "news." In contrast, the Internet, with the mobilization enabled by wireless technology and PDA devices, is accessible at all times, in nearly all places. Because Perez Hilton posts continuously throughout the day, a consumer can check in several times, charting the progress of a celebrity event. In addition, the sheer volume of posts allows for a more minute examination of rises and falls. In this way, Hilton’s blog proves reflexive: it serves not only as a detector of public disfavor, but a catalyst for it as well. Picking up pieces of gossip from a variety of sources, Hilton disseminates this “news” to an audience of millions, thus amplifying public awareness. Even if a star were not previously in public disfavor, the fact that Perez reports that she is effectively morphs rumor into reality, working to bolster or break the economic value of a star. Here, Hilton’s afterthought is significant – while he acknowledges that the gossip may be far-fetched, his perpetuation of such a story subtly influences the reader to believe that regardless of its veracity, such behavior may be believably attributed to the stars in question. Put differently, even a story acknowledged as fake may influence a star’s image, simply by associating that star with a certain type of behavior. Such stories also set a precedent. From June 1st on, Hilton posted dozens of quips concerning Cruise’s purported micro-management and “control-freak” antics with fiancée Holmes. Each story made the next more believable, leading to Perez Hilton’s current speculation that Holmes was paid by Cruise to bear his child in synchronization with the premiere of Mission Impossible III (images 8 and 9 ). Once again, it matters little whether or not Cruise actually paid Holmes. What matters is that the item was so heavily circulated by Hilton and other bloggers that it has appreciably deteriorated Cruise’s star persona. [open notes in new window] Granted, print gossip was publishing the same bits of gossip, but pressure from advertisers and libel laws generally hold print media more responsible for factfulness. What’s more, the frequency with which Hilton blogged these bits substantially intensified their effect and influence. As discussed later, blogs have a categorization function that allows the reader to click on a link, here labeled “TomKat,” and read the blogger’s critical posts in succession, in this case, further intensifying negative sentiment against and suspicion of Cruise. Clearly a blogger with Hilton’s readership may potentially alter public perception of a star. With the release of MI-iii, evidence leads us to believe that he may likewise possess the power, even more than print gossip, to influence the economic value of a star. Perez' ability to affect a star economically thus established, the question remains: why would he choose to do so? Perez effectively launched a campaign against Cruise and his movie, but to suggest he did so arbitrarily is to neglect one of the juiciest rumors in Hollywood: namely, that Cruise is an intensely closeted homosexual. This paper will go on to discuss the manners in which Perez promotes/demotes a star based on their skill of producing a star image. In particular, for Perez, one practice particularly signals what he considers studios' and actors' inattention to the current attitude of star consumers: that is, a star's refusal to come out of the closet. 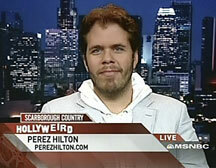 For Perez, refusal to admit to homosexuality reinforces what he views as the “myth” of gayness as box office poison. He considers stars who view homosexuality as a potentially negative component to their star image as woefully ignorant of burgeoning societal acceptance of gayness on all fronts. Furthermore, and perhaps even more economically importantly, such thinking neglects the homosexual community as star consumers. Many homosexuals, especially self-identifying queens such as Perez, have embraced the “fabulousness” of Hollywood glamour as part of their subculture. As homosexuals statistically often have relatively large sums of expendable income , Hollywood marketing should acknowledge and appreciate them as a significant segment of star consumers. In other words, for Perez, neglecting or insulting such a key segment of the consuming public constitutes poor star-image-production values, and merits exposure and ridicule through his blog. “to accept the closet is to have absorbed society’s view of gays, to accept insult so that one avoids harm” (31). “to break such a community-defining convention is to appear to be a traitor to the community. But what appears as treason to some can actually be social reform, as exemplified by civil disobedience, in which, when one breaks a current convention, one hopes thereby to establish a morally improved community” (28). While Perez does not use that exact rhetoric, he, like many others, believes that there is no “right” to any closet, especially the celebrity closet. “I know there is some controversy about outing people, but I also believe the only way we're gonna have change is with visibility...if I have to drag some people screaming out of the closet, then I will. I think that lots of celebrities have an archaic fear that being gay will hurt their career but look at Rosie. Look at Ellen” (MSNBC.com). Indeed, coming out has served as an immense boost to Bass' formerly stagnant career – supporting Hilton's underlying assertion that coming out isn't just a moral obligation, it's an aspect of the economic production of stars. “Bradford's defamatory remarks are of the kind calculated to cause Cruise harm in his profession and his ability to earn [...] Losing the respect and enthusiasm of a substantial segment of the movie-going public would cause Cruise very substantial sums. While the plaintiff believes in the right of others to follow their own sexual preference, vast numbers of public throughout the world do not share that view and believing that he had a homosexual affair and did so during his marriage, they will be less inclined to patronize Cruise's films...” (thesmokinggun.com). In other words, Cruise believes that public insinuation of homosexual activities will damage his star image and, in the process, his economic value. Perez' criticism of Cruise is thus double-sided: If Cruise is indeed gay, he is not only shirking his personal responsible to the homosexual community, but perpetuating what Hilton views as an antiquated equation of homosexuality with economic depreciation. “being gay is not a death sentence in show business. We need to get out of that mind frame. It's 2006, people!” (MSNBC.com). And in 2006, while being gay may no longer economically kill a star, being the target of Perez' star-production-exposing blog very well may.